Apple today has updated the iMac line of desktop computers. The new computers feature Thunderbolt connectivity (10Gbps), more powerful quad core CPUs, better graphics by AMD and more. Prices start at $1,199. Intel Core i5 is the default CPUs on all models and Core i7 is available as a custom order. We expect that these iMacs will arrive to the Saudi Arabia market after 6 weeks. The new iMac features quad-core Intel Core i5 processors with an option for customers to choose Core i7 processors up to 3.4 GHz. These next generation processors feature an integrated memory controller for an amazingly responsive experience and a powerful new media engine for high-performance video encoding and decoding. With new AMD Radeon HD graphics processors, the new iMac has the most powerful graphics ever in an all-in-one desktop. 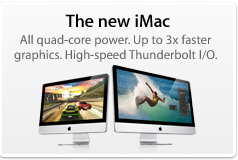 iMac is the first desktop computer on the market to include groundbreaking Thunderbolt I/O technology. The 21.5-inch iMac has a single Thunderbolt port while the 27-inch model features two ports for even greater expansion. 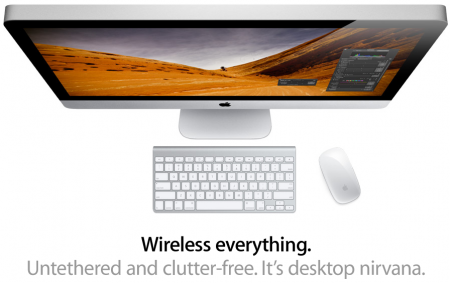 Developed by Intel with collaboration from Apple, Thunderbolt enables expandability never before possible on an all-in-one computer. Featuring two bi-directional channels with transfer speeds up to an amazing 10Gbps each, Thunderbolt delivers PCI Express directly to external high performance peripherals such as RAID arrays, and can support FireWire® and USB consumer devices, and Gigabit Ethernet networks via adapters. Thunderbolt also supports DisplayPort for high resolution displays and works with existing adapters for HDMI, DVI and VGA displays. Freely available for implementation on systems, cables and devices, Thunderbolt technology is expected to be widely adopted as a new standard for high performance I/O. iMac includes a built-in FaceTime HD camera and Apple’s innovative FaceTime software for crisp, widescreen video calling the whole family can enjoy. The new camera supports high definition video calls between all FaceTime HD-enabled Macs and standard resolution calls with iPad® 2, iPhone® 4, the current generation iPod touch® and other Intel-based Macs. The iMac continues to feature its signature aluminum and glass design, gorgeous IPS LED-backlit high resolution display, SD card slot and comes with Apple’s innovative Magic Mouse or Magic Trackpad. Continuing Apple’s commitment to the environment, Apple’s desktop line is a leader in green design. The iMac meets stringent Energy Star 5.2 requirements and achieves EPEAT Gold rating. ** iMac features LED-backlit displays that are mercury-free and made with arsenic-free glass. iMac uses PVC-free components and cables, contains no brominated flame retardants, uses highly recyclable materials and features material-efficient system and packaging designs. Every Mac comes with Mac OS® X Snow Leopard®, the world’s most advanced operating system, and iLife®, Apple’s innovative suite of applications for creating and sharing great photos, movies and music. Snow Leopard builds on more than a decade of innovation and includes the Mac App Store℠ for finding great new apps for your Mac. iLife ’11 features iPhoto® with stunning full screen views for browsing, editing and sharing photos; iMovie® with powerful easy-to-use tools to transform home videos into fun theatrical trailers; and GarageBand® with new ways to improve your playing and create great sounding songs. The new iMac is available through the Apple Store® (www.apple.com), Apple’s retail stores and Apple Authorized Resellers. The 21.5-inch iMac is available in two configurations: one with a 2.5 GHz quad-core Intel Core i5, AMD Radeon HD 6750M and 500GB hard drive for a suggested retail price of $1,199 (US); and one with a 2.7 GHz quad-core Intel Core i5, AMD Radeon HD 6770M and 1TB hard drive for a suggested retail price of $1,499 (US). The new 27-inch iMac is available in two models: one with a 2.7 GHz quad-core Intel Core i5, AMD Radeon HD 6770M and 1TB hard drive for a suggested retail price of $1,699 (US); and one with a 3.1 GHz quad-core Intel Core i5, AMD Radeon HD 6970M and 1TB hard drive for a suggested retail price of $1,999 (US). Configure-to-order options include faster Intel Core i7 processors up to 3.4 GHz, additional hard drive capacity up to 2TB, a 256GB solid state drive, additional DDR3 memory and AppleCare® Protection Plan. Additional technical specifications and configure-to-order options and accessories are available online at www.apple.com/imac. *Testing conducted by Apple in April 2011 using preproduction iMac configurations. For more information visit www.apple.com/imac/features.html. **Claim based on energy efficiency categories and products listed within the EPA ENERGY STAR 5.2 energy database as of April 2011. EPEAT is an independent organization that helps customers compare the environmental performance of notebooks and desktops. Products meeting all of the 23 required criteria and at least 75 percent of the optional criteria are recognized as EPEAT Gold products. The EPEAT program was conceived by the US EPA and is based on IEEE 1680 standard for Environmental Assessment of Personal Computer Products. For more information visit www.epeat.net. You can find the author of this post on twitter: @khaled. Arabic version of this post on SaudiMac Arabic Edition. Please follow SaudiMac on Twitter and add SaudiMac on Facebook. Remember to visit We Want Apple Saudi Arabia petition and spread the word. regardless of whatever mobile phone you use, any carrier, had it been Mobily, STC or Zain, can trace your location through the triangulation method of communication towers you utilize for calling through your mobile phone. In fact, no triangulation method is required; the carrier has a database of all locations of the communication towers so it wont be too difficult for your carrier to trace back your location. i need to know how much is IMAC quadcore 15 2.7GHZ i tb hardrive, please i have a budget 4000 SAR, can you please let me know guys where can i buy this item..PLEASE..